This story takes place in March 1883 in the Glebe, (Present day Merewether). Life was not only dangerous for early miners but also their families. The article below sent to us by Tracy Evans highlights this. It outlines the death of her Great Great Aunt, Elizabeth Waller Gibson. Elizabeth lived in an area known as ‘the Glebe’ and was the wife of a miner. She died after getting hit trying to cross the tracks in front of a coal train in March of 1883. The train was only going at 12kms per hour, but was carrying 32 loaded carts of coal and could not stop. At this time it was common for people to cross the train tracks before oncoming trains. This tragedy and others like it, eventually led to fencing and crossings being erected around train tracks. 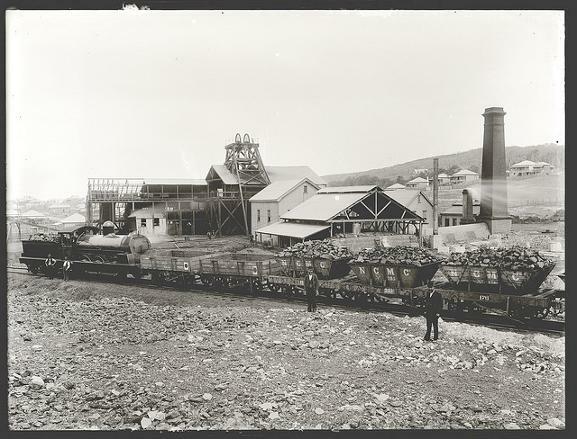 Newcastle Coal Mining Company, B Pit, Merewether, NSW, 24 February 1899. In this picture a train hauling loads of coal can be seen in the foreground. This is the same company that owned the train that Elizabeth Gibson was hit by and this pit would not have been far from where she lived. David Fisher, a youth employed by his father, a storekeeper at the Glebe, deposed that deceased was the wife of William Gibson, a miner, living close to the Albert Victor Hotel; shortly before one p.m. on Saturday he was standing at the head of a horse attached to a cart from which he was selling vegetables, etc., holding it as a coal train was aproaching; saw deceased attempting to run before the engine, when her foot caught in her petticoats and she fell between the rails, the cow-catchers dragging her about a hundred and forty yards; was certain that the engine did not knock her down; ran down the line and found deceased alive, sitting up pulling her dishevelled hair from her face, and clearing the blood away, and also trying to pull down her clothes to hide her exposed body; her left leg had been cut off and was lying some distance away on the other side of the line; seeing some women coming up he ran off full speed for Drs. J. Harris and Stapleton, who happened to be close at hand in his parents' house; the engine was going at its ordinary speed; saw the men at the engine break doing all they possibly could to stop the train. Mary Butler, wife of James Butler, a miner, residing two doors from deceased, deposed to having seen her attempt to cross the line in front of the engine, in order, apparently, to reach the last witness's cart; noticed that there was no chance for her to cross in time, as the engine was close up and whistling;called out loudly, "don't go, don't go," but deceased apparently did not hear; saw her trip up and stagger into the middle of the line before the engine struck her; was certain the engine did not knock her dow; saw that a terrible accident had occured, and did not dare to go to the spot, and saw no more of deceased until her dead body was brought back from the Hospital; did not think the engine was travelling quicker than usual;it was a frequent practice for people to cross the line before the engines; the drivers made a practice of whistling to warn persons, and hearing a whistle sound brought her out to look for her little son; hence she saw the accident; spoke to deceased twenty minutes before, when she was very busy working, and in excellent spirtis. John McNulty, driver of No. 19 engine, stated that when near the the spot indicated he and his fireman noticed a woman making towards the line 20 or 25 yards ahead, and only eight or ten yards away from the metals; sounded the alarm whistle, but she still kept on, and saw her stagger in front of the engine, which was only travelling about seven or eight miles an hour; did all in their power to stop, but the locomotive, and thirty-two loaded coal waggons (the breaks of fifteen of which were pinned down) passed over her; returned on foot and found that her left leg was cut clean off, and was lying on one side of the line, and she on the other; lent what assitance he could till medical aid arrived; could not have stopped the train nearly so soon had a break van only been attached; knew of no rule compelling coal-trains to use a break-van; had previously whisteled half-a-mile further up to warn a man, and had many a time seen children crossing the line, and it was a practice with some of them, out of bravado, to run before the engines, to see who could do it the most times before they reached them; all that could be done in similar cases was to whistle, and take every precaution, etc. By Mr. Keightley; Was the first accident he had known on the line; there was no possible chance to have crossed clear; with ordinary care there was no need for accidents occuring, and the company's trains never travelled after dark or before daylight. Dr. John Harris' evidence showed that, accompanied by Dr. Stapleton, he hurried to the scene of the accident and found deceased between the rails, with her left lower limb torn off about the middle of the thigh; the stump was much lascerated and stained with coal dust; bound it up propmptly and had the patient removed to the Hospital, where, after consultation, he amputated the wounded limb, assisted by Drs. Morgan, Ashe and Stapleton;deceased never rallied, but died about half an hour afterwards from shock procduced by the injuries mentioned. The jury found that the deceased died from injuries accidentally received, and that no blam was attributable to any one. They further added a rider that they, as well as others, were unanimously of the opinion that the Newcastle Coal Mining Company should fence in their line to prevent further accidents.